Thank you for the opportunity to introduce you to CNG Aviation, Inc. Founded in 1994, we are part of a global network of mid-sized aviation parts distributors. Our home office is located in Houston, Texas. Our expertise in parts procurement is the result of our many years of service to the U.S. and International Aviation Community. Our corporate philosophy is simple; to be of maximum service and value to our customers while maintaining the highest level of integrity. Being located in a major international hub means we can have your parts order delivered as quickly as possible, or as economically as possible—it’s your choice! Our client list includes many Fortune 500 companies as well as countless major aircraft manufacturers, operators, repair stations, governments, and military organizations. This list includes: NASA, The United States Coast Guard, Cessna, Raytheon, Piaggio, Lear, Bombardier, Wal Mart, Duncan Aviation, Sierra Industries, General Electric, Exxon Mobil, Boeing, The U.S. State Department, several African governments and military organizations, Marathon Oil, Continental Airlines,…just to name a few. is only one component of our business. Aircraft sales or liquidation often involves special circumstances. Your options are not always clear and the best choices are sometimes counterintuitive. We have the skills to help you determine the right course of action when the time comes to sell, trade-in, or liquidate your valuable asset. We also provide professional consulting services. 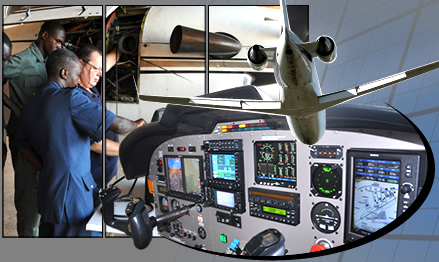 We have fully trained professionals with many years experience in all areas of aviation. We are capable of helping you streamline your existing operation or completely organize a new operation from the ground up. We also work in close proximity with the insurance industry and its loss adjusters, supplying parts and equipment, and organizing aircraft recoveries and transport to maintenance stations. Consequently we have a wide range of contacts and the potential to assemble teams of experts and tools to respond to urgent needs arising in various locations. Today’s aviation environment is very demanding—from regulation to operation, from purchasing to maintenance. Spare parts are the backbone of any aviation operation. We work for you by getting as many quotes as possible on every part we procure. Furthermore, each and every part we procure goes through rigorous inspections and quality checks to insure the parts you receive meet the highest possible standards. This is only a fraction of what we do in order to meet our corporate philosophy; to be of maximum service and value to our customers while maintaining the highest level of integrity! Many of our customers, especially those who are not served by major repair stations, engage us to manage the repair or overhaul of their turbine and turboprop engines. We benefit from a strong relationship with many major US repair facilities including Dallas Airmotive and Standard Aero. This relationship allows us to closely monitor each phase of the repair process and thus minimize the overall costs to the customer while minimizing the time required to complete the process. Another specialty of CNG is aircraft procurement—from Air Tractor crop dusters to 737’s, King Air to Gulfstream V, we can handle your procurement needs. We have delivered aircraft to several African companies/governments. When our customers add a new type of aircraft to their fleet, we make sure they have the technical programs in place to properly manage their new assets. This includes, but is not limited to, creation of highly customized training programs developed around the unique needs of each customer.